The Chinese Crested Dog has been known in China since the 13th Century, where it was developed during the Hang Dynasty into the two types seen today. These are the fine, elegant ‘deer’ type and the heavier boned ‘cobby’ type. The hairless vary in degree of coat from no body hair to those having a fine down similar to that found on a human arm, but all have the characteristic ‘cresting’ that helps give this breed its name. This cresting consists of soft, fine hair growing from the top and tapers off down the neck. A plume of hair is found on the lower two thirds of the tail, and socks of hair on the feet and lower legs. It may also come in a drop-eared variety as well as the prick-eared type that is essential in the hairless Crested. The Crested has also been present in Europe for centuries as shown in artwork from the 15th Century and was mentioned in the chronicles of Christopher Columbus. Regarded as a curiosity at first, the Crested has grown in popularity as a pet and show dog. Chinese Crested dogs can live up to ten years of age, but can extend this to 12 years if given the proper care and nutrition. These animals in peak form should see the male weighing 6kg and growing to 33cm tall, and the female should weigh 3.5kg and grow to 23cm in height. 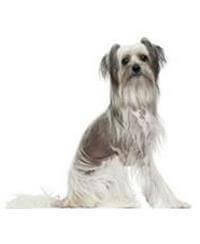 The Chinese Crested is a confident, graceful and alert dog sometimes aloof with strangers. It can be strong willed, but not snappy or aggressive. Not known as a yappy dog, it can, however, prove useful as a watchdog. Unlike many other breeds it is capable of curling its feet to hold and grip objects. Although a toy breed in size, it is far from being a toy in attitude or outlook. The Chinese Crested has proven highly compatible with other animals, including cats and horses. dryness a non-allergenic moisturiser should also be applied. It is not known to shed, is rarely bothered by fleas, nor does it have a ‘doggy’ odour. The teeth in the hairless are not those of your average dog as ‘tusks’ replace the canines and the teeth may be loosely rooted or even missing. This is associated with hairlessness and is not a cause of concern. A Crested will fit in virtually anywhere as long as you have the time to spare to give it the attention it feels is its due. Although it will wait patiently for its owner's return when left alone, it prefers to be with you. Suitable for many situations, Crested owners range from active singles and families to the elderly, and this breed makes its home anywhere from a flat to a farm. A Crested will become part of most lifestyles, accompanying its owner through daily life – always ready to take part in almost any activity or just as ready to curl up on an accommodating lap. Active or not so active, it doesn't seem to matter as long as there is shared love and attention.